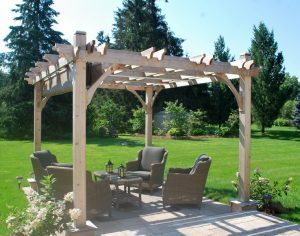 There are so many stylish and functional ways to incorporate traditional wood, cedar and composite wood products into your landscape. Traditional wood decks have a rustic and relaxing feel. Our hand selection process avoids cracked, splitting and warped boards. 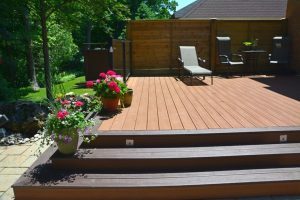 Low-maintenance composite decks can incorporate a variety of colors and styles. No painting, staining or sealing is required, so you have more time to enjoy the outdoors. Modern privacy fences and screens create a secluded space in any neighborhood. 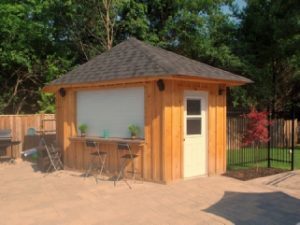 Custom pergolas, cabanas, outdoor rooms, raised garden beds and sheds add beauty and function to your space. Why Choose Earthworks Landscaping ? While there are a number of landscaping contractors to choose from, earthworks landscaping is a locally owned, family run business. We have over 10 years of experience in landscape construction in the Burlington & Oakville area. We can help you navigate local zoning requirements and the permit process. Earthworks Landscaping is committed to providing the outdoor space you desire with quality workmanship we stand behind. As a result of our commitment, we have an industry-leading warranty. i) We meet at your home to discuss your needs and answer any questions you have. ii) Our estimator will measure and inspect your property. iii) Next, we provide you with a written estimate, recommended dimensions and material options. iv) earthworks landscaping will work with you to schedule your project. v) Finally, a team of experienced landscaping professionals arrives to build your landscape project. Ready to start your project? Book a consultation online or call us at 905.638.0790. We will arrange for one of our landscaping specialists to visit your property. 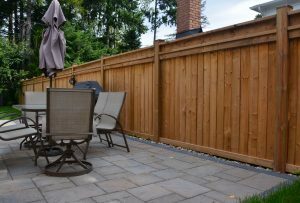 We will discuss your vision and collect the information we require to provide you with a detailed estimate for your deck, fence or wood project.